This is a little story about a sandwich and a bakery. I make a lot of quick “from scratch” meals over here. Sometimes lunch is just what my kids are eating (often yogurt and a piece of fruit), but sometimes I want something hot and more sophisticated. One of my favorite meals is an open-faced broiled sandwich, a tartine in French. Last year the San Francisco Magazine did a feature on many of the mouth-watering sandwiches available in our city. I found the description of one sandwich particularly arresting–an apple gouda sandwich with rosemary on a walnut loaf from a new bakery called Sandbox Bakery in the Bernal Heights neighborhood. On this description alone I became inspired to create a tartine style sandwich in my kitchen. I always have a bit of bread in my kitchen, some sweet-tart apples, rosemary in our yard, and Rembrandt aged gouda in my fridge. As you will see in the notes below, the most important steps in this simple, wonderful combination of flavors are slicing the apples really thin and broiling the top until the cheese bubbles and just browns. Now, I would love to tell you how my tartine compares with that of Sandbox Bakery. The thing is….I never tasted theirs. They feature a different sandwich every day around lunchtime, but I always go in the morning rush, at 7 or 8am. I have, however, tasted almost every single crunchy, steamy, soft, chocolatey, and fruity breakfast pastry they make. Our house averages about a trip every other week–a pilgrimage really–to this superlative French-Japanese bakery. For you pastry-conoscenti, I think their morning buns and other croissants easily rival those of the acclaimed Tartine bakery in the Mission. Their “melon pan,” a Japanese brioche pastry with a deceptively simple egg-wash and sugar crunch top is divine. The morning buns are perfectly soft layers of croissant dough with carmelized orange-cinnamon sugar enveloping the outside, giving it a shattering crunch too. We love the perfectly made scallion cheddar biscuit with its Southern lightness and little nibs of melted cheese. Fruit croissant with cinnamon apples and pastry cream? Valrhona chocolate croissant? Are you drooling yet? Their perfect De La Paz drip coffee and cappuccinos? Best. Breakfast. Ever. So, go check out their pastries or even their apple-gouda sandwich if they are serving it that day. I am still curious about how it compares with mine. Before I give you my recipe, the only thing to keep in mind when making this is that you want your slices of bread (maybe your homemade ciabatta?) to be either stale, or pre-toasted so that the side touching the roasting pan doesn’t become soggy from the moisture of the apples. Also, I love the sour-briny pickled onions and a spicy lettuce piled on top. I was in a hurry this time and forgot the salad, but both the pickled onions and an arugula, watercress, peppercress, etc. play really well with the sweet apple and the aged gouda. 1. Thinly slice the red onion, salt, and add vinegar just to cover in a small bowl. Let sit minimally 15 minutes or up to a week in the fridge. 2. 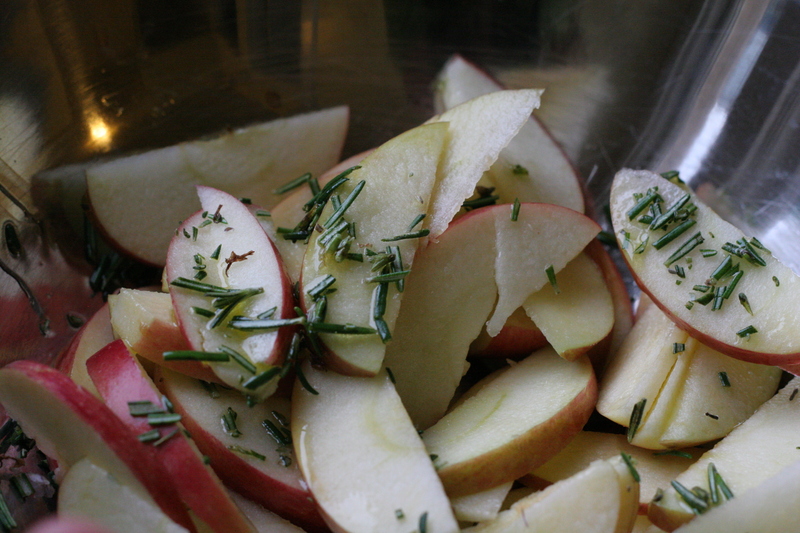 Slice the apples and toss with rosemary and olive oil. For uniform sized apples, quarter the apple long ways from stem to bottom. This lets you easily chop out the core. Put the apple quarters skin side down and cut thin slices (no more than 1/8 inch thick). 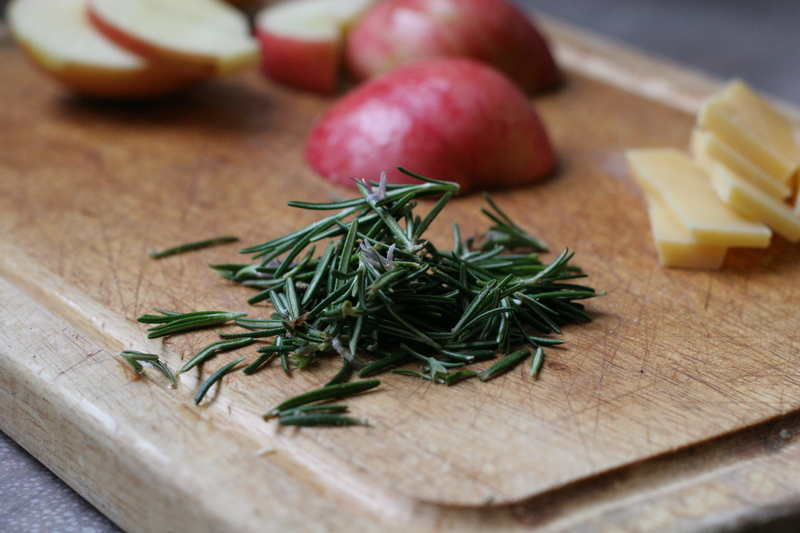 Toss in a bowl with the olive oil and chopped rosemary. 3. 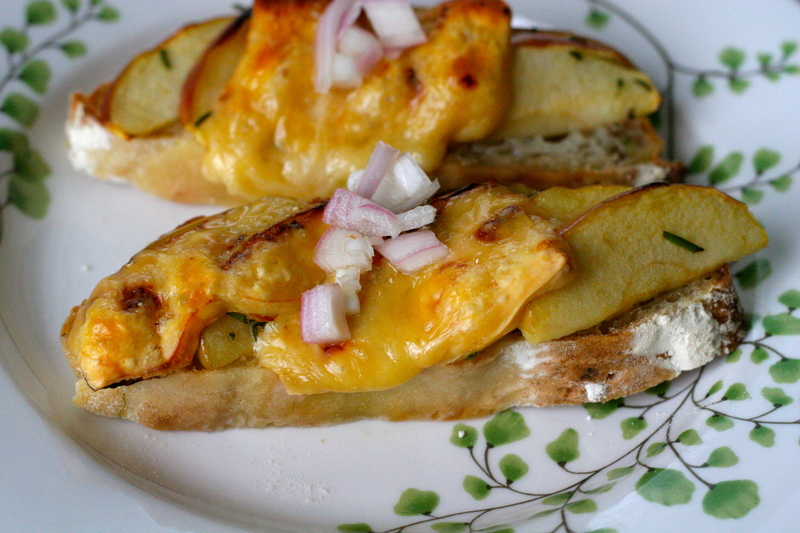 Arrange slightly overlapping slices of the tossed apples on top of each bread slice and top with a long slice of the aged gouda cheese. I adore the flavor and salt crystals (much like a good Parmigiano) in Rembrandt’s aged gouda. 4. Put under the broiler or in your toaster oven on high until the cheese is bubbling and has begun to carmelize to a light brown. 5. If you made the onions and you have a spicy lettuce like watercress, peppercress, or arugula, arrange that on top of your hot toasts, sprinkle with sea salt, and enjoy. This entry was posted in Dinner, Lunch and tagged Aged Gouda, Apple Tartine, Apple-Rosemary, Sandbox Bakery, Tartine Recipe. Bookmark the permalink. Mmmm! I love the combination of sharp cheese and sweet apples. The pickled red onions are a brilliant garnish! P.S. The photos are wonderful. Thanks Jenny. Actually I prefer cutting the onions long and thin and this time a certain someone who will not be mentioned cut them for me. I am going to take another picture next time because they look so much prettier with long, thin pickled onions.